Mayme, aka JD's Mommacita, is a 6-year-old red fawn female, born November 9, 1999. Her sire is the famous Molotov and her dam is Kiowa Vernon. Mayme was turned into the Fort Worth Animal Shelter along with her sibling, Shelley. 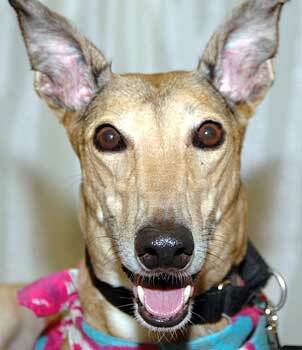 There is no racing record for Mayme shown on Greyhound-Data.com. She does show to be a brood matron, having two offspring in March 2003 when she was bred with Oneco Cufflink. It appears she could have had another litter within the past year. 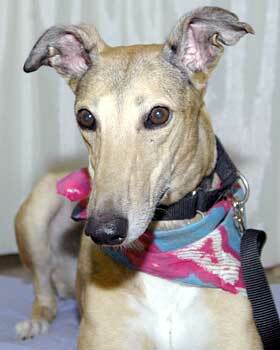 When Mayme arrived she had Sarcoptic Mange and tested positive for Ehrlichia and Babesia. Her treatment has been successful for all these conditions, and she is ready to find her forever home! She is a sweet and loving little girl who will make you smile! Miss Mayme has passed her cat test. She was interested in the cat when she saw him through the doorway, but later walked up to him with her tail slowly wagging, gave him a look and a sniff and then went "hmmpph" and walked away. She watched the cat walk across the floor but did not care to get too close. After a while she got a good sniff of the cat when he was on the desk and didn't seem to care. Mayme came to me about four months ago looking like one big scab with lots of hair missing from the mange and she was terribly under weight. She came in a little unsure of where she would get her next meal, but now understands that it comes on a regular basis with lots of love. As you can see from her recent pictures, she has grown a complete new coat of soft beautiful red hair with darker highlights. Although she still needs to put a few more pounds on, she is doing 150% better. She is very affectionate, is easy going, enjoys her walks, loves going for car rides and would make a perfect companion at work. She behaves very well and is happy to "sit" or "down" for a treat. 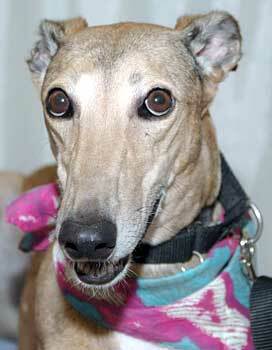 The sparkle has returned to her now confident eyes and she is ready to find her forever home. She is quite the cuddler and would do well with other dogs or as a single pet.